This years Valentine’s Day Ithaka got published on Waves website regarding his next event at the F+ Gallery, in Santa Ana, California, this February 21st. The event will focusses on Ithaka’s newest art work, the “Aliens Of AkahtiLândia” series, from 7 to 10pm, showing 7 of his giant “surfboard/bug sculptures”, some of his mixed-media paintings and photographs of the bugs he daily draws, paints and photographs. An inspiring and increadible view of the alien like insects that the southern zone of the Amazon Forest holds, away from most of our eyes and that Ithaka marvelously shares with us through his unique talents. The theme is so extraodinarly curious to the publics interest that the exhibition will equally envolve 4 local guest artists that will be depicting Ithaka’s insects through drawings and paintings of their own. 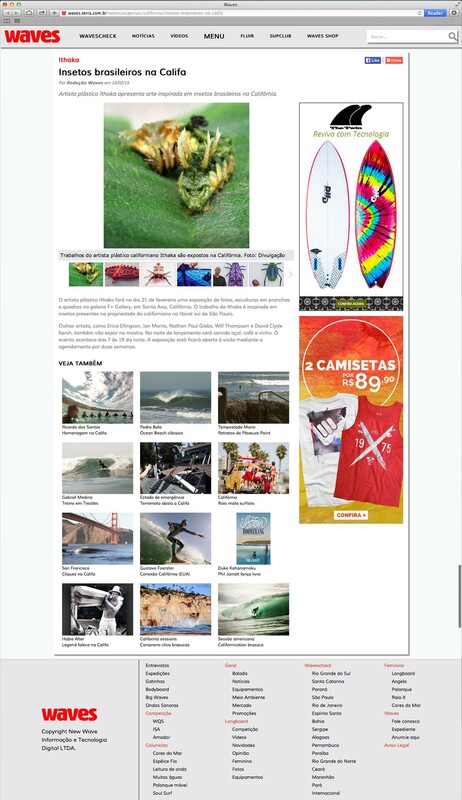 Read the full article above or jump to Waves website at http://waves.terra.com.br/waves/especiais/california/insetos-brasileiros-na-califa for more info.